The "Case Blue" Theater of War DLC mini-pack adds new maps, on top of the free ones recently added. 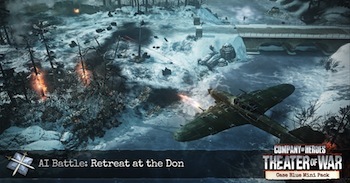 We here at The Escapist liked Company of Heroes 2 a lot, even if Russia didn't. However, that was months ago, more than enough time to win a virtual war. Now, Relic's helping make sure that the battles never have to end with a few free multiplayer maps and a DLC mini-pack. The "Case Blue" DLC focuses on single-player and co-op maps. Based off of the real-life German campaign on the Eastern Front, it documents the Wehrmacht's attempts to capture the oil-rich Caucasus region. it contains two solo challenges, two AI battles, and one co-op scenario. The Voronezh scenario has you and another player coordinate infantry and vehicles to take over a Russian city. The Tiger Ace solo challenge revolves around strategic use of an early production Tiger Tank, while the Destroy Convoy challenge is just what the label says. Once you have that down, you can take on the Don River and Kharkov AI Battles, where you'll have to take on the Red Tide as the Wehrmacht faces Soviet counterattacks. If you'd rather face a human opponent, then you're also in luck, as two new multiplayer maps were recently added, completely free of charge. The pack is $9.99 and can be downloaded from Steam. However, if you bought either the Pre-Order Edition or the Digital Collector's Edition, check your accounts, as you should have it available for download.